When the Wild Rivers Mushroom Club sent out an e-mail with Tony and Pam's recipe for Chicken with Wild Mushroom Ragout (based on a presentation by Gordon Ramsey), we simply had to try it, and was it awesome! We knew that it had to become our March Recipe of the Month. The recipe actually came from a Gordon Ramsey TV program but no measurements were given & Pam played around with the ingredients and added some others until it tasted 'great'. You can still 'tweak' it more yourselves. The chicken recipe for the sauce was our first attempt, since then we have used the sauce on pork & halibut. We are pretty sure that the sauce can be used on a wide variety of foods. 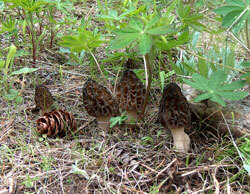 You can also use (we have) a mix of dried hedgehogs and black trumpets if your supply of morels is low. It's still a great sauce but, not quite as special as it is with morels. We used morels from Mt. Hood in our preparation. We never cease to be amazed by our talented neighbors in the hamlet of Port Orford, and photographer Stephen Thompson is certainly one of the most amazing. We'd recommend a visit to his website (www.earthseaimagery.com), where you'll discover the diverse gifts of this largely self-taught photographer and artist. We're particularly impressed with his restoration services (backed up by over 40 years of experience in this specialty) and his extraordinary collection of historic photographs, including a noteworthy assemblage of railroad and steam locomotives photos as well as of Port Orford and southern Oregon coast images. 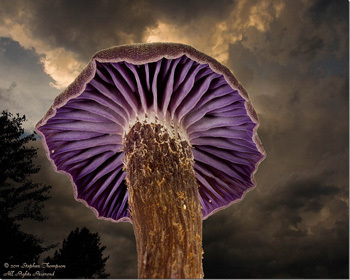 Being a neighbor and friend has special privileges, and we're often the recipient of some of his mushroom photographs. We have his permission to share the following with you. We think that you'll agree that Stephen's keen eye and photographic genius add another dimension to wild mushrooms! I suppose we are all traditionalists at heart. Certainly I am when it comes to mushrooming. I have my traditional spots both here in Port Orford and on Mt. Hood that I need to visit on a regular basis. 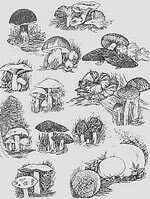 And, I have my traditional mushrooming forays: New Year's Eve, New Year's Day, and Super Bowl Sunday. Yes, you read it right - Super Bowl Sunday. It may be the day that other folks spend glued to their TVs watching the game and rating the advertisements, but for me it's my last mushrooming trip of the season. Typically, my basket fills with Hydnum Repandum, those delicious pale orange-tan mushrooms with spines that we commonly call "hedgehogs". This year, however, with the lack of consistent rain, the hedgehogs were scarcer than usual in a grove of tan oaks near our home that they tend to favor. Nonetheless, the mushroom gods were smiling gently on me. I was able to collect a generous amount for our delicious roasted mushroom recipe, but, alas, not enough for the dehydrator. I think it's time to put it away until the fall season brings another fruiting of wild mushrooms to our traditional spots! 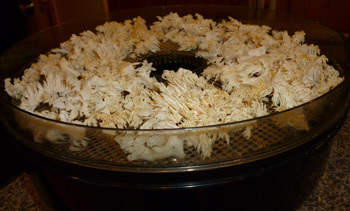 This year our dehydrator preserved hedgehogs, corals and one very welcome cauliflower. OK, I confess. We've joined the many folks who "Groupon." 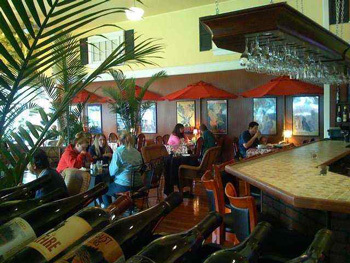 McKeown's Restaurant is one good example of the reasons why we enjoy Groupon, and will no doubt keep on "Grouponing!" For the un-initiated, Groupon is an internet service that e-mails participants a coupon available for purchase each day for your area (or other areas you can sign up for). If you buy that day's Groupon, it entitles you to a great deal on something - a visit to a restaurant, a stay at a motel or a resort, service for your car, etc. The deals are usually about 50% off the regular price, and must be used within a specified period of time. Why merchants are willing to discount their services so steeply is that it's a great way to introduce themselves to a whole new market. That's one of the main benefits to folks like us, too; it can introduce us to places we've never been to, and may never have heard of. And of course, there are some great deals. Without Groupon, we would probably never have found McKeown's, at the corner of Holladay and Broadway. The restaurant is a little off the beaten track (several blocks from the Turnaround, a well-known Seaside landmark), but I think it may become our go-to restaurant when we're on the northern Oregon coast. It's a lovely place, bright and cheerful, with a number of large plants lending to the congenial atmosphere. The waitress was accommodating and friendly. There were some very interesting choices on the menu, including Kobe Beef Chopped Steak with Mushroom Merlot Sauce and an Irish Cottage Pie. The Kobe Beef item tempted us (and with the mushroom sauce, qualified McKeown's for inclusion in this section, rather than the "unmushroom" one), but we had other ideas. A new restaurant discovery, thanks to Groupon. There's really so much to love about Salem. It's our state capital, of course, and however you may feel about what goes on there, it's interesting for that alone. But there's more: museums, art galleries, vistas that include the Willamette River, minor league baseball, Silver Falls State Park to the East and Willamette Mission State Park to the North and, of course, shopping. All in all, it's a charming city of about 154,000 citizens that's easily accessible from our home in Port Orford (and most every place else in western Oregon), and we often seem to find ourselves gravitating to it for a weekend getaway as we did earlier this month. Annette's Westgate restaurant was an Internet find. After viewing the menu and spotting razor clams (one of Steven's perennial favorites!) featured, we knew we had to head for the historic Kingwood Building where Annette's is located and give this place a try. The clams were large, tender and flavorful, and so was everything else. My chicken fried steak (one of their most popular items, according to the waitress) with garlic mashed potatoes filled the very large plate. The salad bar was astonishing, with an abundance of selections including chopped turkey and ham, pumpkin seeds, dried cranberries, seaweed salad and marinated mushrooms. I'll bet I haven't seen a salad bar that generous in 30 years. The dessert case was plump with an assortment of cream pies, cinnamon rolls, cheesecake and other yummy looking selections. Frankly, I'd like to meet the person who has room for dessert after eating dinner at Annette's! A delightful dining spot in Salem. Congraulations to Nancy Latulippe of Ontario, the Grand Prize Winner in Taste of Home's "Comfort Food Favorite" contest! Her delicious beef stew carries the intense flavors of dried mixed mushrooms and whole baby portobello mushrooms in a rich beef base that includes chunks of chuck roast, chopped carrots and onions, minced garlic and rosemary. Topped with crumbled blue cheese, we think that you'll agree that this beef stew is indeed worthy of the Grand Prize! We used cauliflower and boletes that we had dried last fall.